Here is a device of 10 year old girl that has built a science fair project that appears to be unusually efficient. 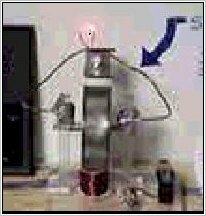 Here is the device a student that John Bedini talked to about a motor and she built it with a little help on the phone, it generates power and runs at 4000 rpm. Here is the MPG of all the since fair awards she took with one of my motors. Still plugging away through schools now with the kids. This is the all North Pole Motor, the Led on the top is the generator, she built this Motor all by herself, she took all the first place ribbons plus a special award in science it used a nine volt battery and ran the whole time the science fair was on for 5 days when they stopped it. John remarks that if a ten year old can do this and win what the is wrong with the whole world. 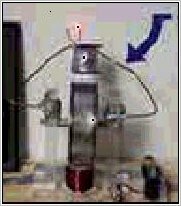 Two stills from the video showing the motor running from a single 9VDC transistor battery and running a generator that lights the LED on top. 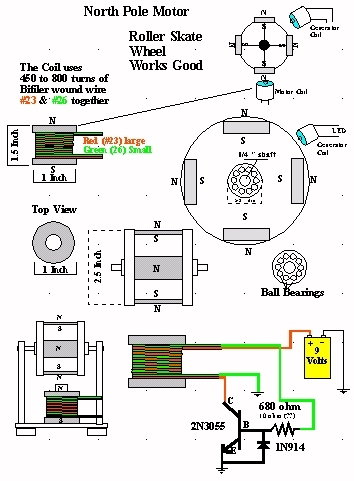 A diagram of the motor showing the magnets between two cylinders which apparently are forced to spin when the coil at the bottom pulses and where the coil at the top generates current to drive the LED. 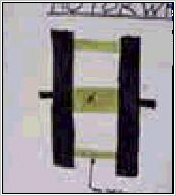 Looking at the picture, it appears the shaft of the wheel is driven by a slot car type motor that is driven by the battery. As the wheel rotates, the magnets between the discs induce current in what looks like a coil on the bottom which recharges the battery??? And another coil on top which lights the LED??? 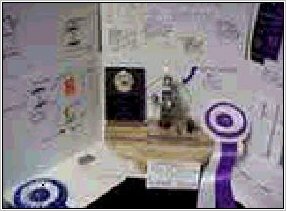 Some of the ribbons and awards won by this amazingly simple highly efficient science fair demonstration motor. 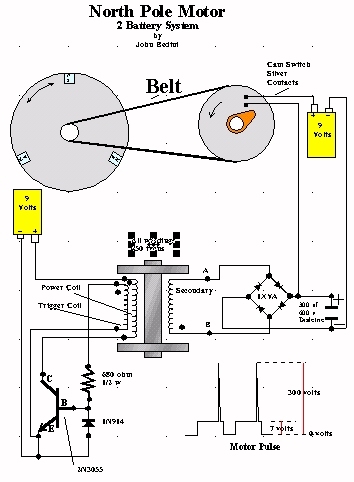 If the motor is a 1.5vdc slot car motor, they easily draw from 200 milliamps (300 millwatts) to 500 millamps (750 milliwatts). 4000 rpm with this kind of power usage should NORMALLY drain that 9VDC battery in a couple of hours. John says this circuit ran for 5 days (120 hours!!) on the single 9vdc battery, that is amazing and the girl should be congratulated for demonstrating it to win the science fair awards. We hope you build your own motor and prove it for yourself. This battery was measured by the science teacher before the motor was turned on and it measured 8.9 volts. These batteries are usually 400 millamps batteries for one hour, The motor was running on 22 millamps at 4000 rpm. 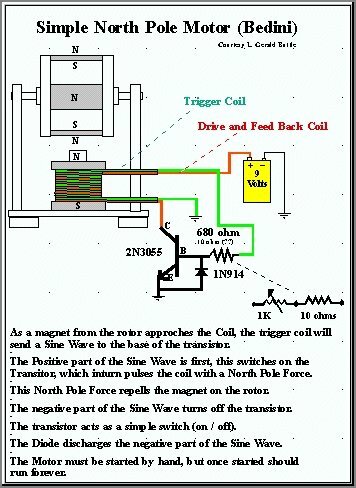 (look for the all North Pole Motor in the notes) this is the same motor that anybody can find in the lab notes on the energy21 web page. It's like John has said all along these motors when built like he have said not changing anything have no problem doing this, John Bedini claims to have a motor setting on the same batteries for 12 years at in his shop. John also claims to have been doing these motors for a very long time, In his life he claims also to have found the answer to getting results and this is with the school kids because they do not change things and they learn, wile the others change things. John claims if people would just build it the way described the inventor would get the results the he claimed, and then make improvements we would be energy efficient right now. 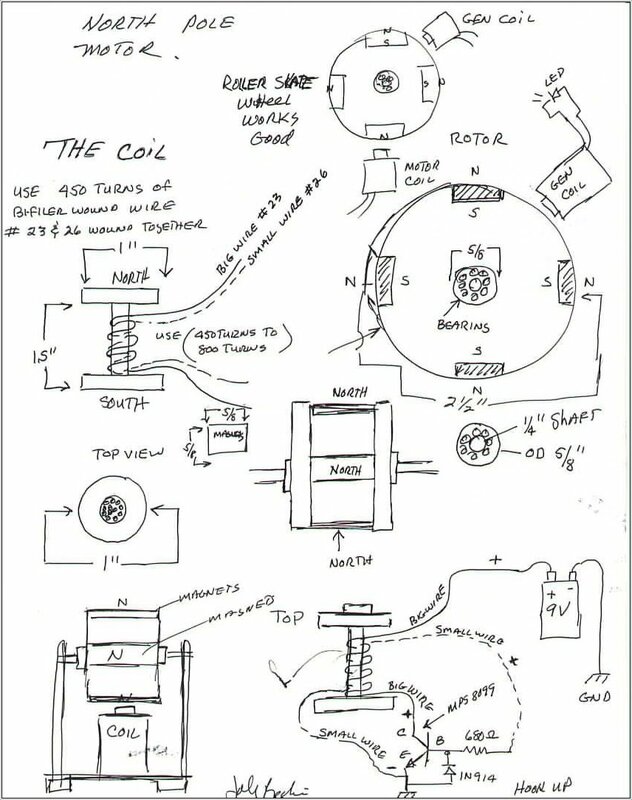 John courteously has sent this cool diagram on of the motor the 12 year old built and he given permission to post it, it is so clear that I decided not to redraw it. 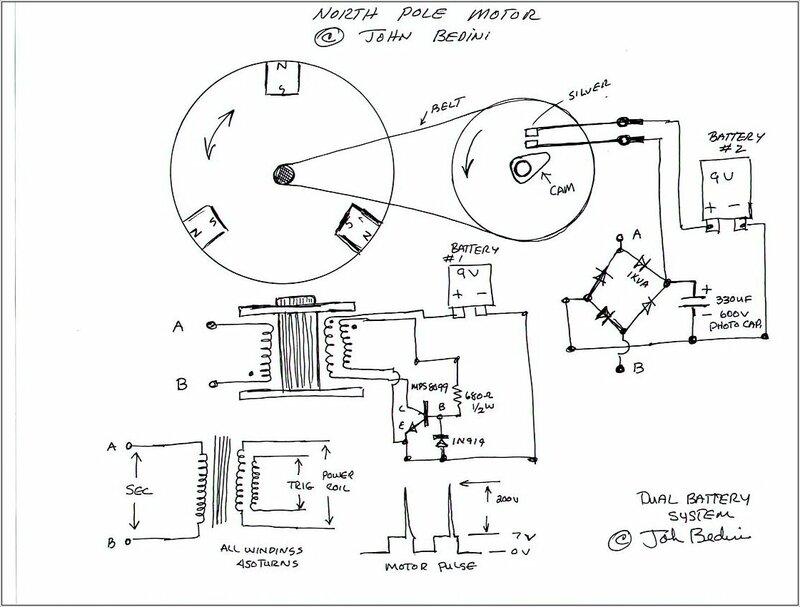 If you choose to build this very simple motor, please share your thoughts and experiences with us at energy21 newsgroup as below and/or with John. Q1 is an MPS8099 bipolar transistor or a 2N3055 transistor, 10ohm resistor, 1N914 diode. 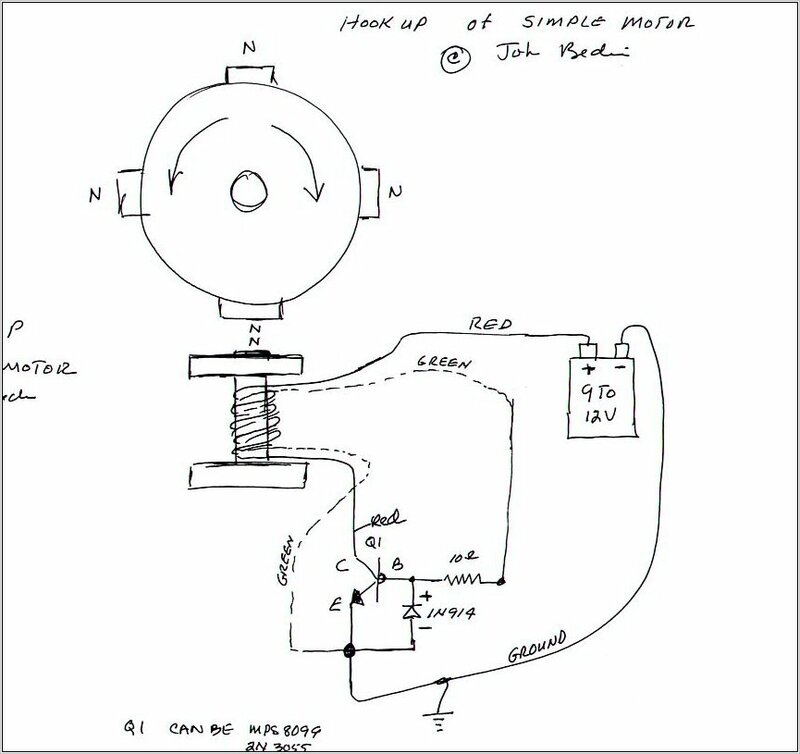 John also wrote that he cuts welding rods into the length of the coil form, then inserts them into the center hole around which the wire is wrapped to form the coil, this increases the magnetic flux as an 'iron' core transformer. and another internet user offered the following as his understanding of this device.